Over the past 30 years, the NHS has been insidiously converted into a market-based healthcare system. This process is accelerating under the Coalition government and the very existence of a National Health Service is in danger. How did it ever come to this for Great Britain’s most cherished institution? You are invited to a unique free screening of this award-winning film, together with a Q&A session with the directors, Nandan Saxena and Kavita Bahl with John Hilary, Executive Director of War on Want. This is a story about cotton farmers in the Vidarbha region of the Indian state of Maharashtra. The film investigates how Monsanto, in collusion with the government and politicians, promoted genetically modified Bt Cotton field trials amongst farmers. This was accompanied by propaganda about high yields and reduction in pesticide use. Spr_ins and gr_zes. Do not need A&E. There was an ‘NHS’ logo in the top-right corner. S_re Thr_at? Won’t need A&E. And there was the logo again. You may think that ‘betrayal’ is too strong a word. 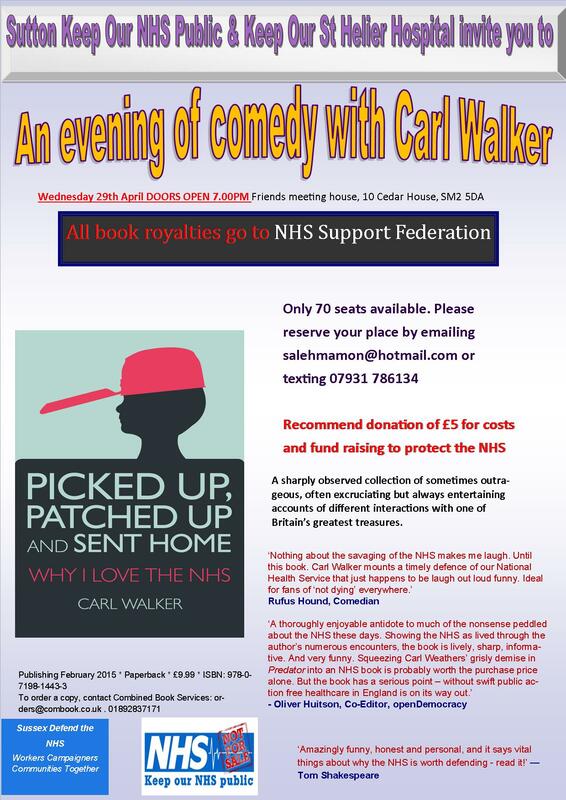 Then come and listen to health professionals who are campaigning to defend and keep the NHS as a public service. Let us debate and engage with the key issues that are largely ignored by the mainstream media. The Health and Social Care Act of 2012 is a historic turning point. Under the guise of putting GPs in control, it requires that all services must be put out to a competitive tender by the Clinical Commissioning Groups. So far most of the contracts open to competition have been won by private providers. The truth is the NHS is the most cost effective health service in the world and it is now being prepared for extensive privatisation. You may not see much of it before the election of 2015 but there will be rapid acceleration after the elections and within five years the NHS as we know it will cease to exist except for the ‘logo’. Sutton cannot be isolated from the national trend and the threat to St Helier Hospital still remains. Unless we mobilise to defend the NHS as a public service, we will lose it. So please join the campaign.